A 30-ish South African, who writes and plays under the name David Seven. Which is a fair observation. Many people, including me, find it easier to write now and edit later. However many people also struggle to leave something less than perfect, and prefer to take their time trying to craft it before moving on to the next page. There seems to be a general feeling that quantity is the enemy of quality. 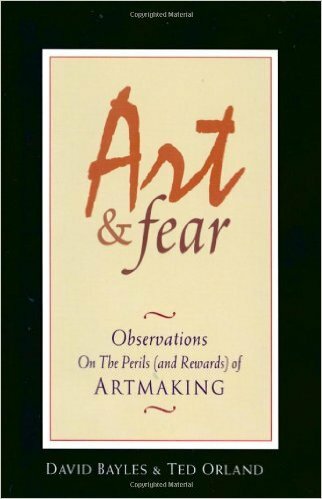 Which brings me to an interesting story from Art & Fear : Observations on the Perils (and Rewards) of Artmaking. The ceramics teacher announced on opening day that he was dividing the class into two groups. All those on the left side of the studio, he said, would be graded solely on the quantity of work they produced, all those on the right solely on its quality. His procedure was simple: on the final day of class he would bring in his bathroom scales and weigh the work of the “quantity” group: 50 pounds of pots rated an “A”, 40 pounds a “B”, and so on. 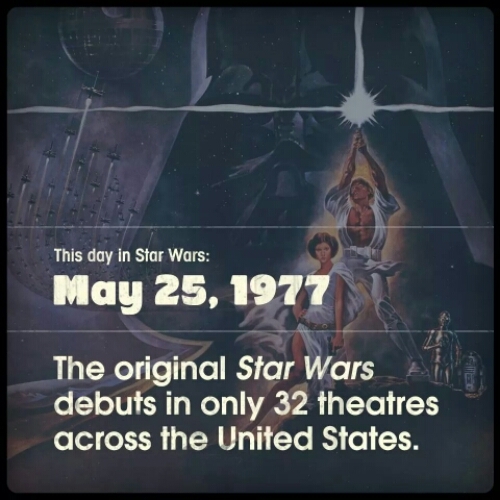 Those being graded on “quality”, however, needed to produce only one pot — albeit a perfect one — to get an “A”. Well, come grading time and a curious fact emerged: the works of highest quality were all produced by the group being graded for quantity. It seems that while the “quantity” group was busily churning out piles of work—and learning from their mistakes — the “quality” group had sat theorizing about perfection, and in the end had little more to show for their efforts than grandiose theories and a pile of dead clay. Okay, that might not be true, but wouldn’t it be a cool plot for a book? Unless you think you can do better. In which case, I invite you to join me for National Novel Writing Month this November and take part in the excitement and madness of writing 50,000 words in 30 days. For Asgard, For Sparta, and for Freedom from Fowl Oppression everywhere! 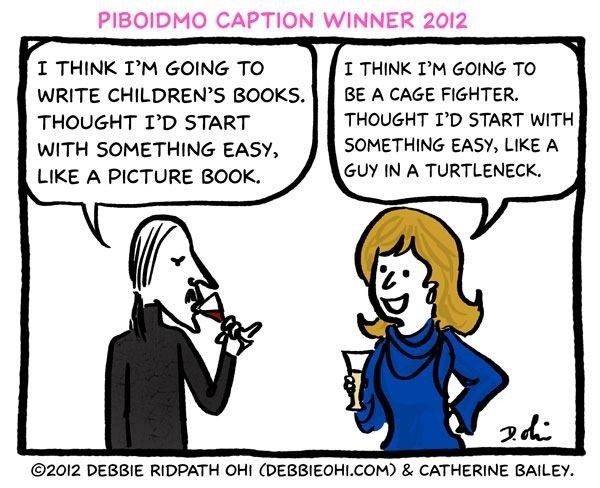 Courtesy of the ever talented Debbie Ohi. In response to my post yesterday, with the unlikely title of “I may have been mistaken,” I found this old cartoon on my computer which proves that for every supposed flaw on “old” technology, there is a counter-argument against the new. Or maybe I just like it. On a side note, I mentioned yesterday that one of the ways that e-readers will never replace printed books is the smell. 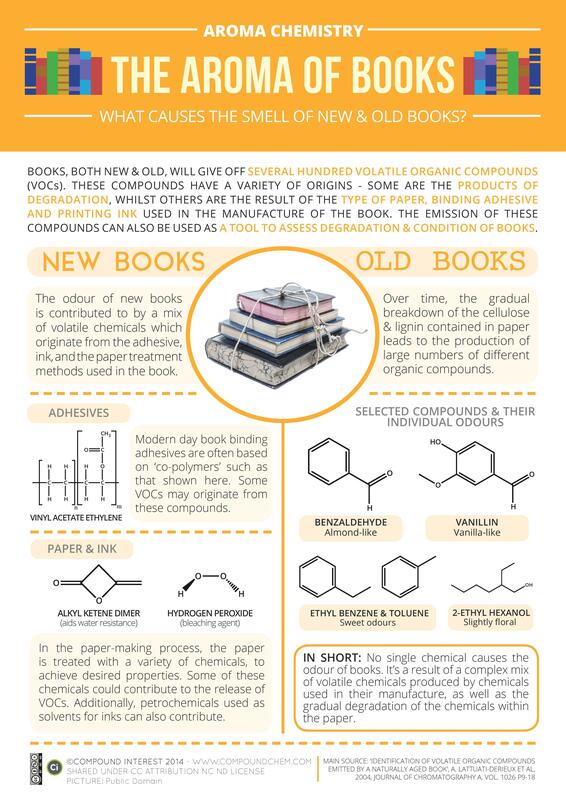 Which got me thinking about why New Books and Old Books each have their own distinctive smell. And I found an very detailed, and scientific explanation for it here. Or you can just read the summary in the picture. I turn up my nose, and say “No, but I read the book,” whenever asked about a film adaptation. 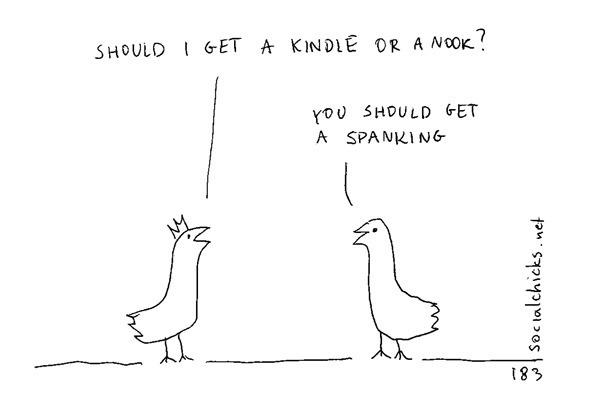 And I believe that Kindles and E-Book readers are not the same as real books, and will never replace them.